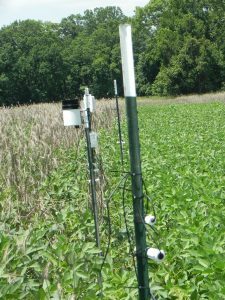 With this project, we are attempting to evaluate winter and summer cover crops established on permanent beds for open-field and protected culture specialty crop production systems in WV. On commodity grain farms, we are interested in comparing rolled green cover crop versus standing cover crop with corn and soybean production. We plan to demonstrate the use of the Roller Crimper Technology on three farms – a commodity grain farm, an organic dairy farm and a vegetable farm. One or more educational events will accompany each of the demonstration/trials conducted on the three different farms during the fall of the second year of the grant period, to discuss results from two years of trials and bring a group of farmers out to see the early establishment of fall cover crop plantings. 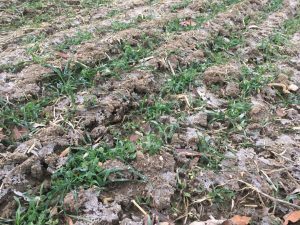 Cover crops were established in open-field plots at Sickler Farms in Barbour County, WV on October 20, 2016. The cover crop mix included triticale, tillage radish, winter pea and crimson clover. Each legume species was inoculated prior to seeding and broadcast-seeded followed by cultipacking. Rainfall occurred within 24 hours after seeding. Emergence was observed 10 days after seeding and in the spring, 2017, the field will be partitioned into 5 permanent beds for no-till vegetable demonstration and production. On October 26, 2016, cover crops were established within a high tunnel at Sickler Farms. Triticale, crimson clover and winter pea were broadcast-seeded followed by raking the seed lightly and overhead watering. One half of the growing zone was subsoiled using a broadfork. Emergence was observed within 10 days. Beginning in March, 2017, the cover crops will be cut and used to establish permanent beds for crop production and demonstration within the high tunnel. 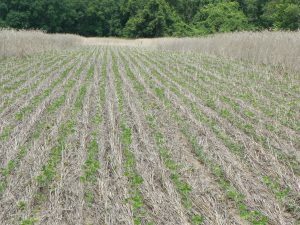 Winter cover crops were established in Fall, 2016 at Sickler Farms in Barbour County West Virginia. Sickler Farms is a highly diversified specialty crop farm. However, the farm topography makes most of the field plots vulnerable to soil erosion. 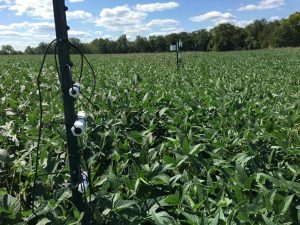 Therefore, integrating cover crops within the rotation pattern for this farm will significantly improve the overall efficiency of the farm. In addition the farm will serve as a case study for a small, diversified farm which successfully uses cover crops. Species evaluated included winter pea, crimson clover and triticale. 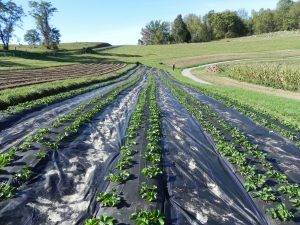 The cover crops were seeded in open-field and high tunnels in Mid to late October, 2016. Field plots had poor stand establishment of the winter cover crop species and were planted in spring oats the following spring 2017. The high tunnel plots, however, had significantly greater stand establishment and vigor of all cover crop species. 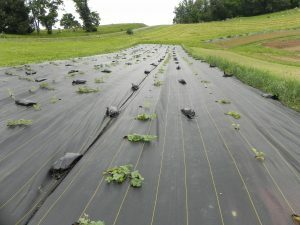 The cover crops within the high tunnels were covered with black, woven groundcover fabric in early April (Figure 1) and subsequently planted with cantaloupes in late April. The field plots were also covered when the spring oats reached a height of 10 inches. The oats were mowed with a rotary mower and the woven fabric tarps placed over the field for planting watermelon and cantaloupe in late May, 2017 (Figure 2). Harvest of cantaloupes within the high tunnel commenced in late June while field plots were harvested in late August. 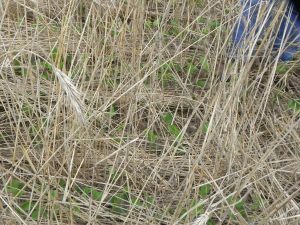 A summer cover crop was evaluated in field plots. 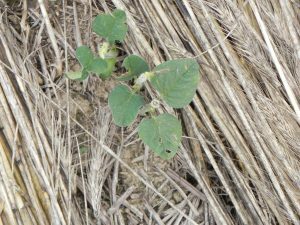 Sunhemp was seeded in early July, 2017 on a field which was scheduled to be planted in annual strawberries in late August. The sunhemp was mowed in mid-August, the soil tilled, rebedded and planted in strawberries (Figure 3). In Fall, 2017, the field which was previously dedicated to demonstrating a permanent bed, no-till system was re-bedded, rolled and drilled with winter pea, crimson clover and triticale in mid-October (Figure 4). Three weeks later, the high tunnel plots (non-raised beds) were broadcast seeded. Late spring of 2018 the no-till planted cover crop with winter pea, crimson clover and triticale was terminated using geotextile fabric and a cabbage variety trial was established. Due to excessive rainfall this crop was damaged and no data was collected. 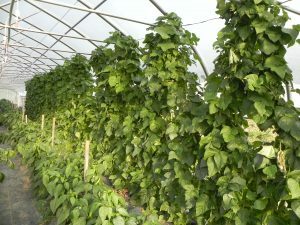 In the high tunnel the cover crop was also smothered with geotextile fabric and a pepper and half runner bean crops were planted. In July of 2018 a No-till vegetable production twilight meeting occurred. Eight commercial vegetable producers attended with discussion focusing on no-till, cover crops and cropping methods. A no-till tranplanter was demonstrated at this meeting. 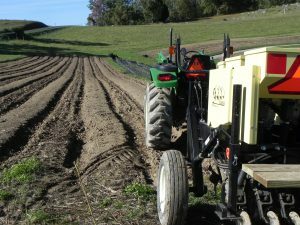 This fall, Sickler farms made use of the WVU no-till drill to establish cover crops in the same location, the permanent raised beds that grew the summer cabbage crop. 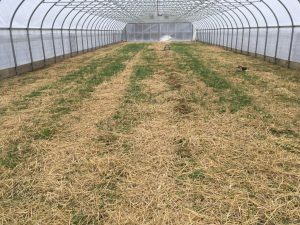 A different cover crop establishment method was demonstrated in the Sicklers high tunnel. A summer Tomato crop had been mulched using oat straw. 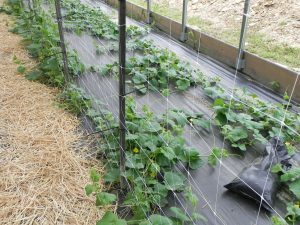 This straw remained in good condition in the high tunnel and after the tomato plants were removed the cover crop seed was broadcast into the mulch and the house was irrigated to sprout the cover crop seed. The oat straw enabled good seedling establishment and the cover crop is thriving this winter. This farmer has an increased understanding of no-till vegetable production with cover crops. 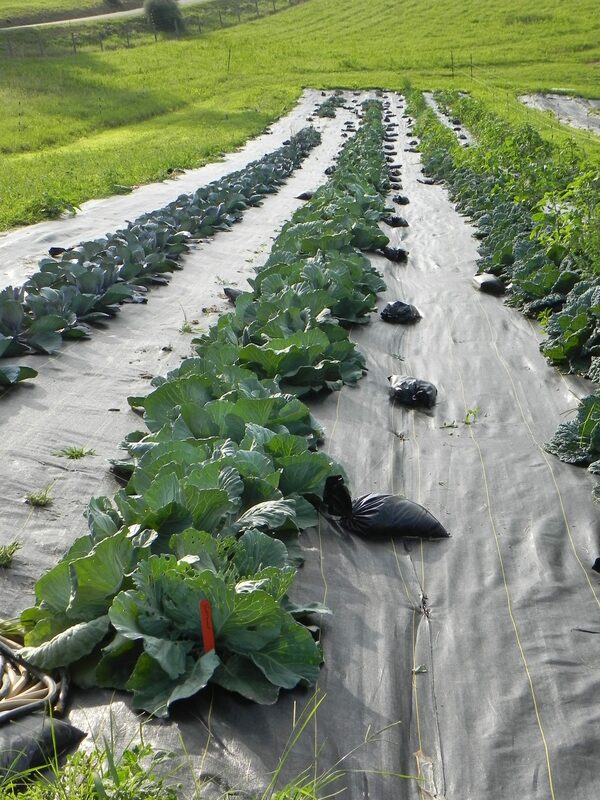 This no-till/cover crop adoption occurred because of continuous WVU Extension Service Guidance, the availability of the WVU No-Till Drill and the use of geotextile fabric to terminate the cover crops without herbicide or tillage and establish the main season crop into the fabric covered raised beds or high tunnel areas. 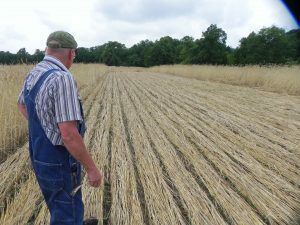 A cereal rye cover crop was established on Mike Wolpert’s farm in Mason County WV. Due to commodity crop prices for corn grain he has switched his cropping for 2017 to soybeans. The cereal rye will be rolled and crimped or left standing with the soybeans planted into the two treatments. A USDA roller crimper has been loaned to WVU. A quick attachment modification unit has been fabricated so the loaned roller crimper can be used on Mike Wolpert’s tractor. Cereal Rye grain was planted to a rental field in October 2016 at 2 bu. Per acre. The following spring when the rye cover crop had reached the milk stage of grain fill the cover crop was rolled and a soybean crop was planted (Figure 5). Each treatment was replicated four times. Crop emergence was good for both rolled and unrolled cover crop treatments. Deer pressure on the emerged seedling began to become evident as the crop developed with the majority of the damage being done to the rolled/crimped sections of the field (Figure 6). To determine soil moisture treatment effects a set of Hobo data loggers with 8 soil moisture meters and a rain gauge. Four meters were placed in a rolled/crimped plot and the other four meters were placed in the soil in the unrolled treatment plot (Figure 7). These instruments were purchased without project funds, costs to the PI was $3,200. August 23rd photo above of rolled/crimped treatment soybeans showing no moisture stress. Rainfall data from the Hobo units showed optimum soil moisture for both rolled and unrolled plots with timely rains occurring throughout the growing season. 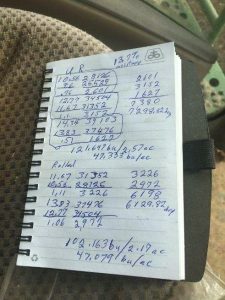 Plot were harvested November 12, 2017 with a GPS enabled combine. Plot Data was shared by Mike (Figure 8). As we are initiating this cover crop project our single outcome was the successful fall planting of cover crops on all of our cooperating farmers fields. These cover crops were established at the proper time and a good stand was visible on all demonstration fields.